A student holds a placard during a protest at the state university grounds in Manila on Feb. 14, 2019, in support of CEO of Rappler, Maria Ressa, who was arrested a day earlier for cyber libel case. Ressa was freed on bail on February 14 following an arrest that sparked international censure and allegations she is being targeted over her news site's criticism of President Rodrigo Duterte. 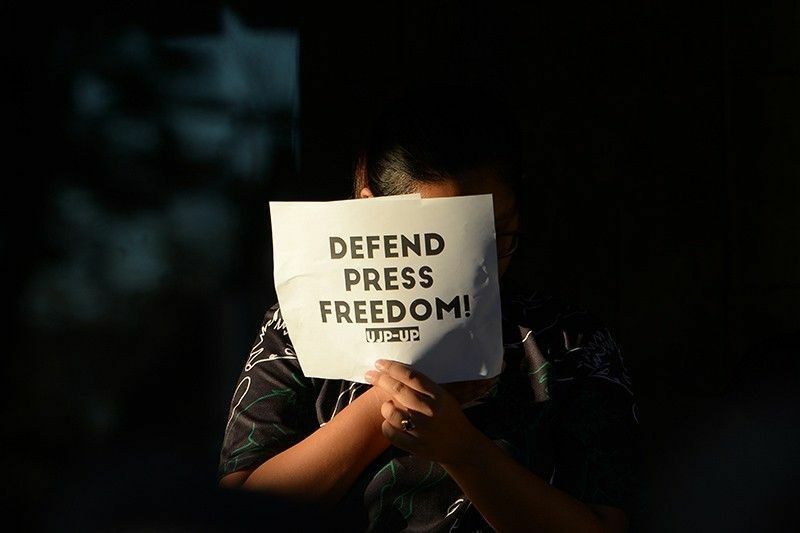 MANILA, Philippines (Updated 4:13 p.m.) — A mission of international journalists Tuesday expressed alarm on the “increasing levels of intimidation” on Filipino press. Committee to Protect Journalists conducted a mission in the country and met up with journalists and government officials, including Justice Undersecretary Markk Perete and the Presidential Task Force on Media Security. The conference was attended by CPJ board chair Kathleen Carroll and its Asia program coordinator Steven Butler, and Australia-based Alliance for Journalists Freedom director Peter Greste. Carroll raised that there have been reports of cyberattacks especially on smaller news organizations. “We were told it’s not the purview of press safety task force,” Carroll said. “I found that hard to believe and alarming and perhaps we heard wrong but we don’t think so,” she also said. “The task force does not seem to be thinking that as an issue. We hope that they can reconsider,” Carroll added. On March 29, alternative news sites Bulatlat, Kodao Productions, Altermidya and Pinoy Weekly filed a civil complaint against IT companies they believe are involved in cyberattacks on their websites. The websites of these alternative news outlets have been targeted by Distributed Denial of Service attacks since late December 2018. DDoS, according to the Electronic Frontier Foundation, “aims to make online resources temporarily or indefinitely unavailable by flooding them with so much traffic that their intended users cannot access or use them. The CPJ also raised concern on the 11 cases filed against Rappler and the government officials “repeated” attacks against the press, including the withholding the license of TV network ABS-CBN. Butler, CPJ’s coordinator for Asia, said that they believe that the cases against Rappler—which range from tax law violations to cyberlibel—“are likely to be politically motivated” and have “broader impact on the freedom of the press.”. Butler said that the findings of their mission would be created into a journal that would be uploaded on their website. The Malacañang has repeatedly distanced itself from the cases against Rappler and denied that cases against the news website and its officers are political persecution. In a Facebook post, Presidential Communications Undersecretary Joel Sy Egco, also PTFoMS executive director, slammed the mission's findings as a "twisted, unjust and unfair depitction of how things are out here." Egco said that when CPJ and AJF officials came to the task force’s headquarters, PTFoMS clarified the issues raised. "Unfortunately, none of those we talked about was included in this statement," Egco said. “During the meeting, it was obvious that the CPJ delegation was pressing very particular issues on DDoS attacks as claimed by those who ‘believe’ the government was behind such attacks. Assertions based on belief as Bible truths? You gotta be kidding me," the former journalist also said. Caroll, during the press conference, said that the delegation was welcomed warmly by the offices they visited for their mission. Egco also claimed that the delegation boarded a vehicle with the markings of ABS-CBN, one of the media entities that President Rodrigo Duterte has criticized in his speeches for their allegedly being biased against the government. Egco pointed out that the panel also talked with National Press Club Vice President Paul Gutierrez and Publishers Association of the Philippines president Nelson Santos. "Niloloko niyo ba kami? Eh, katabi ninyo sa upuan si Paul and Nelson? Ano tingin nyo sa kanila, haoshiao?" he said. When Ressa was arrested by NBI agents on the cyberlibel charge, the National Press Club warned against injecting politics into the case. The press club also said that it is not uncommon for journalists to face libel suits. Their statement ran in contrast with those of other local and international press groups, some officials of the government and the academe who said the arrest is part of a government attack on dissent and is a threat to freedom of the press.